VICKSBURG, Miss. 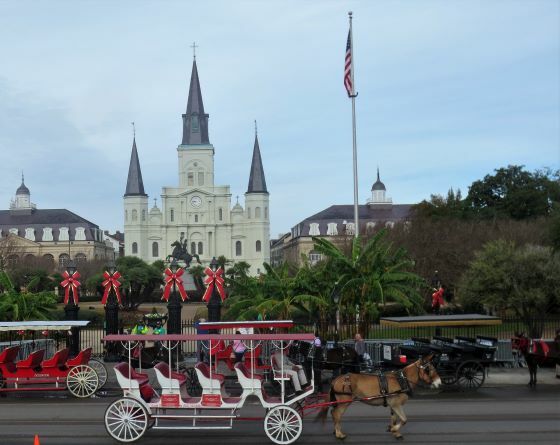 — This placid town of 50,000 people on the east bank of the Mississippi River about 230 miles northwest of New Orleans isn’t exactly known as a den of iniquity. Yet, in the late 19th century, Vicksburg was one of the main distribution hubs of cocaine in the United States. No, the city wasn’t the headquarters of an international drug cartel. And the surrounding fields grew cotton and soybeans, not coca plants. Turns out, Vicksburg was the site of the very first Coca-Cola bottling plant. In those days, part of the drink’s recipe, which was invented by an Atlanta pharmacist named John Pemberton in 1885, actually contained cocaine in the form of an extract from the coca plant. 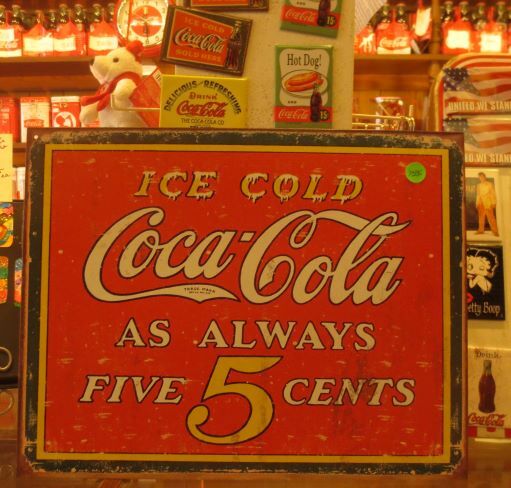 Hence the name “Coca-Cola.” At the time, cocaine was legal and used in a variety of medicinal products. In 1894, Vicksburg native Joseph Biedenharn began bottling the drink in a two-story brick building in the heart of the city’s downtown. 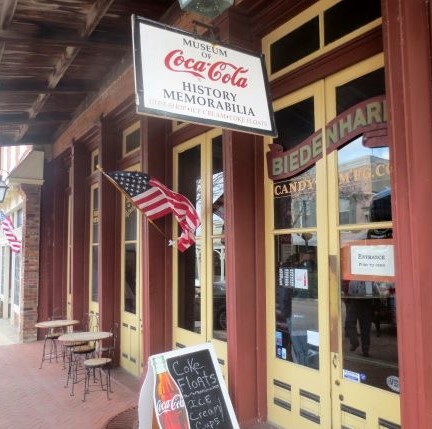 Today, the Biedenharn Coca-Cola Museum, owned and operated by the Vicksburg Foundation for Historic Preservation, is one of the city’s most popular tourist attractions. 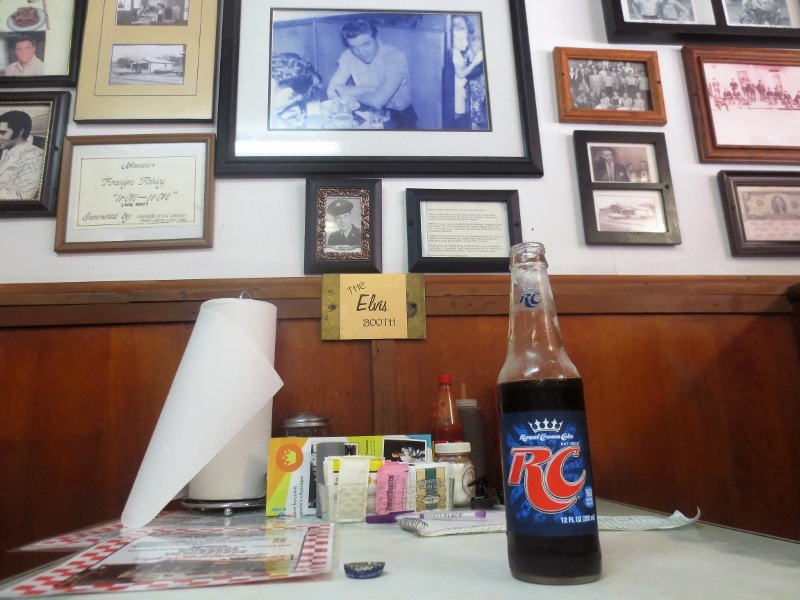 I recently spent a morning learning about the history of America’s most iconic soft drink during a stop in Vicksburg while on a weeklong cruise on the lower Mississippi River. I was sailing on the American Duchess, a paddlewheel-propelled riverboat owned by the American Queen Steamboat Co.
Interestingly, there was absolutely no mention of cocaine at the two-story museum amidst all the displays showcasing the history of Coca-Cola. 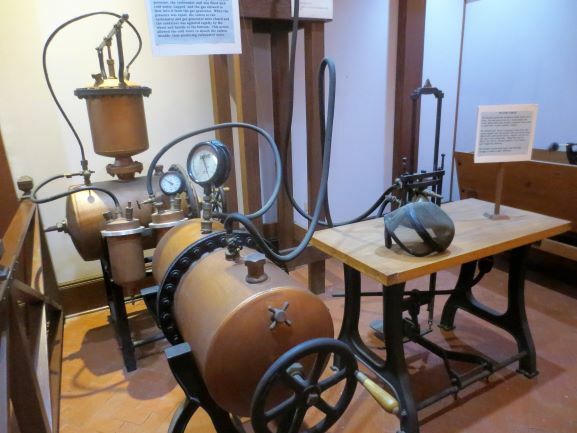 There was a reproduction of the equipment first used to bottle Coke, a soda fountain dating back to 1900, lots of memorabilia and old Coke ads. I’m told cocaine will do that. One of the museum’s docents confirmed that cocaine was used in the early days of the beverage, until the company noticed that teenagers were lingering a bit too long at the soda fountains, consuming copious amount of the cocaine-laced drink instead of going to school or work. Due to public pressure, cocaine was eventually removed from the beverage, while the amount of caffeine was tripled. “They substituted one buzz for another,” the docent told me with a smile. Today, Coca-Cola no longer contains even a trace of cocaine. Unless you want a sugar high or caffeine buzz, you’ll have to get your kicks elsewhere. Atlantic City may have the reputation of a city in decline, but its boardwalk remains a sought-after destination. The city is actually attempting to bounce back from some severe financial difficulties radiating outward from unsuccessful casino and real estate deals, and a little bit of life is coming back to it. Even during the worst of times though, the boardwalk held a certain charm – despite portions of it having something of a lighthearted ghost town vibe. Many don’t fully grasp the history of the Atlantic City boardwalk as – almost ironically – a symbol of American progress and grandeur. 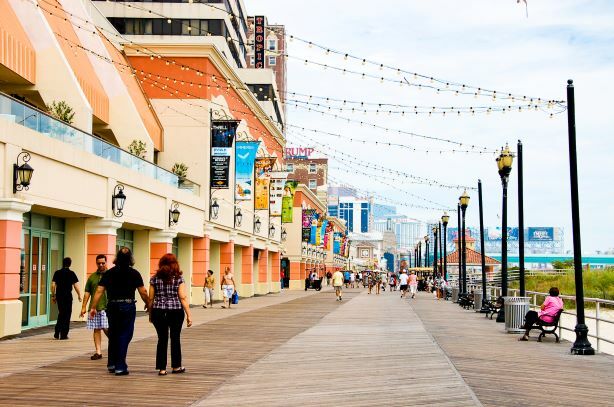 It may actually help to know that it is this same boardwalk that, along with other locations around Atlantic City, inspired the board game Monopoly (in which the Boardwalk is famously the most expensive and lucrative property on the board). It’s just a game, but in a way this gives you an idea of how the area was once perceived, in its heyday. 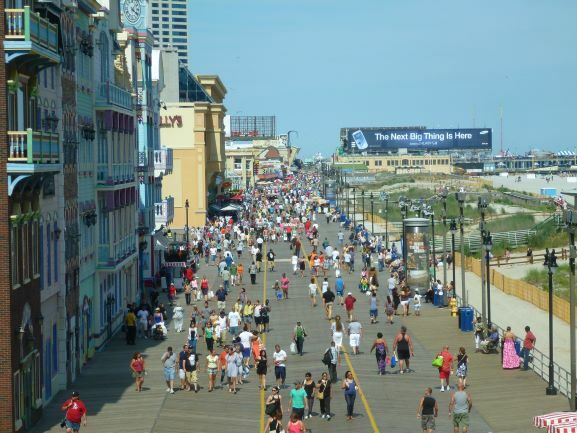 But what is it actually like to walk the Atlantic City boardwalk today? You can’t get quite the right idea from playing Monopoly of course, nor from watching the famous drama Boardwalk Empire. Furthermore, most travel articles focusing on Atlantic City revolve exclusively around the casinos, and neglect to convey the boardwalk’s appeal. Here, though, are a few things you can still enjoy about this particular attraction, regardless of any decline the city around it may have experienced. For one thing, you can get a strong sense of history. There remains a sort of intangible, late-19th or early-20th century vibe on the boardwalk, such that you can almost imagine it as a thriving hot spot in simpler times. The very idea of a boardwalk such as this is less and less common, particularly in the American Northeast, so if you like to have a sense of the past when you travel, this is something you can really cherish. In a more active sense, you can also enjoy easy access to the beaches and the surf that run alongside the boardwalk. Atlantic City’s beaches don’t have the most glowing reputation around the country, though most who have spent time there would agree that there’s some complexity to the perception. Surfers have called the ocean dirty, sketchy, and beautiful simultaneously. The Netflix comedy Friends From College spent a whole episode more or less mocking Atlantic City as a destination before showing characters on the beach at dawn admitting that from the right angle, the place is kind of beautiful. Basically, it’s a beach area you have to experience the right way and gain an appreciation for, but in its own way, it’s quite nice. The Boardwalk also gives you quick access to some of the main casinos of Atlantic City. Now, as implied previously, these aren’t quite what they were once upon a time. Casinos played a role in largely bankrupting Atlantic City, and the comeback of the gaming industry has taken place largely online, with New Jersey’s sites for legal gaming attracting a great deal of activity and revenue. With all of this said though, the actual casino venues of Atlantic City are, if anything, nicer than their reputation. They are not shabby, poorly maintained traces of what they once were; they’re simply not quite as glamorous as some would like them to be. If your goal is a nice meal at a fancy restaurant, a few cocktails in a casino lounge, or the games themselves, you’ll still have a nice time. Lastly, but maybe most importantly, you can enjoy the establishments that line the boardwalk itself. Little shops and cafes are still operational along the boardwalk, and there’s just something charming about being able to make your way along a wooden walkway on a nice day, popping in and out of these establishments and enjoying the ocean views. Candy shops, clothing stores, souvenir shops, and even places for fresh fudge and salt water taffy are among your options. All in all, though it may not be quite what it once was, the Atlantic City boardwalk remains interesting and, in its own way, charming. It’s worth a stop on any vacation to the general area. Gabe Miller is a freelance writer and travel enthusiast. 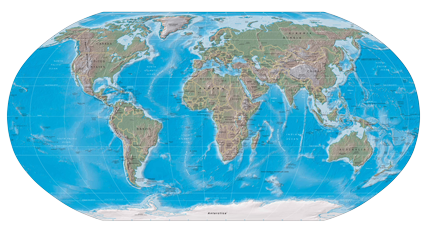 He writes about popular landmarks, exploring new cities, and various other adventures around the world. 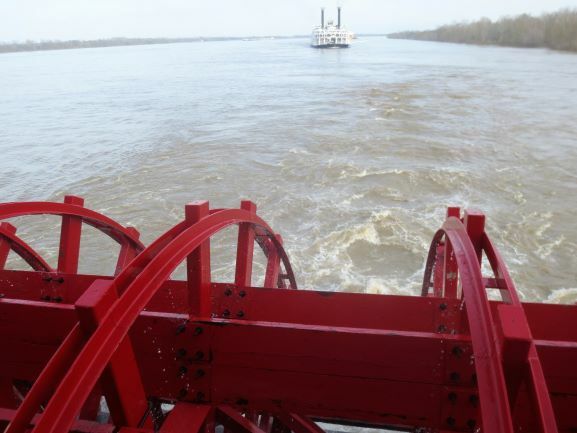 THE LOWER MISSISSIPPI RIVER – Big wheel keep on turning. The American Queen Steamboat Company’s American Duchess in Vicksburg, Miss. John Fogerty’s 1969 iconic song about hitching a ride on the “Proud Mary” evokes images of paddlewheel-propelled steamboats hauling people and cargo on the Mississippi River through the American South. 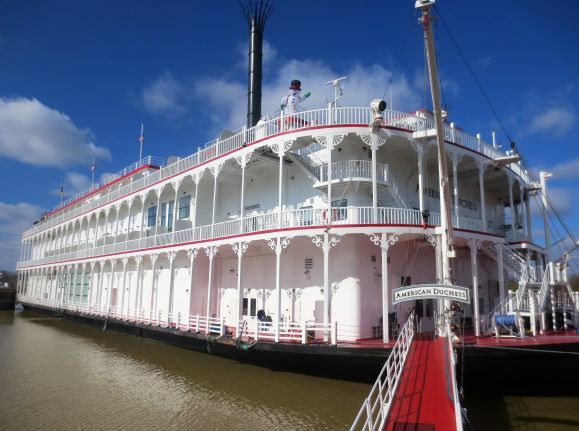 I recently spent a week on one of the paddle-wheelers — the American Queen Steamboat Company’s American Duchess, originally built as a casino riverboat in 1995, then elegantly refurbished in 2017 to accommodate 166 passengers. The boat, which reaches a top speed of 15 mph, resembles a floating two-tiered white wedding cake with red frosting. According to Joe McKey, the Duchess’ Captain, the red paddlewheels on the back of the boat aren’t just for nostalgia. They provide 20-30 percent of the Duchess’ propulsion; the rest coming from diesel engines (see video shot by the author: paddlewheels propel the American Duchess). 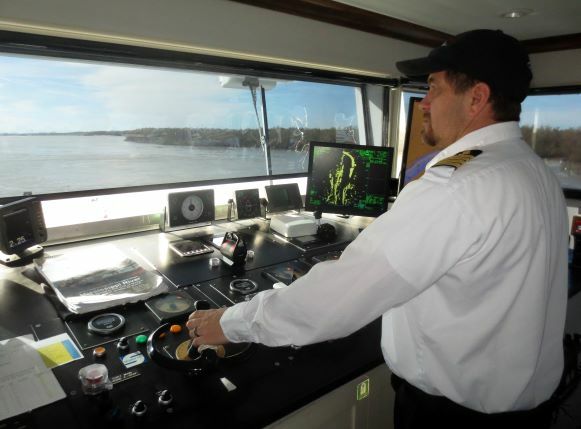 Cruising the Lower Mississippi is an eye-opening way to learn about the region’s history – good and bad – and the rich mixture of Creole, Cajun, French, Spanish and African-American cultures, which has created one of the most diverse and intriguing melting pots in the country. The cruise started and ended in New Orleans, which has rebounded nicely since it was decimated by Hurricane Katrina in 2005. Like most of the ship’s passengers, I arrived a day before the cruise departed so I could explore “The Big Easy.” I walked through the city’s historic heart, the French Quarter, and dined in one of New Orleans’ most famous restaurants – the century-old Arnaud’s – known for its Creole cuisine and live jazz music. It was the first time I ever tried alligator sausage, an Arnaud’s specialty. After leaving New Orleans, the Duchess stopped in four ports in Louisiana and Mississippi. In each port, American Queen provided free hop-on, hop-off buses with tour guides so that we could explore at our own pace. “Premium excursions” were also an option. Priced at around $70, they focused on specific themes or sites like the Civil War, Southern cooking or cotton plantations. It was sobering to learn about the lives of slaves working the sugarcane and cotton plantations we visited. Our guides didn’t try to romanticize the South’s antebellum history, instead painting a realistic picture of the slave trade and the awful conditions that millions of Africans brought to the Americas against their will had to endure from early colonial days to the end of the Civil War. 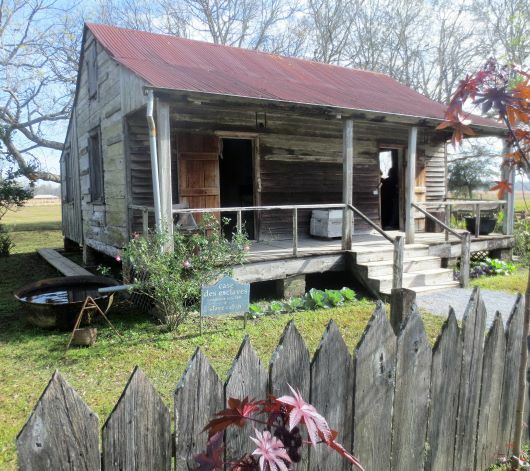 “We don’t shy away from that kind of stuff,” said guide and historian Kyle Crosby, when I asked if I could see the 180-year-old former slaves’ quarters at the Laura Plantation, a woman-run-and-owned Creole sugarcane plantation near Vacherie, La. We were taken to the cabins where slaves lived – typically two families per cabin – which have been restored to show what conditions were like for the more than 300 slaves who once worked the plantation’s sugar fields. In Natchez, Miss., we stopped for a visit at the notorious “Forks in the Road,” which at one time was the second-largest slave market in the South. Located about a mile outside of the city limits, there’s little to see other than some signs and small markers. But the historical magnitude of the site – where human beings were bought and sold like cattle – was difficult to absorb. It somehow seemed fitting that it was pouring rain during our visit to the Forks in the Road. Not so fittingly, the site is located on Liberty Road. 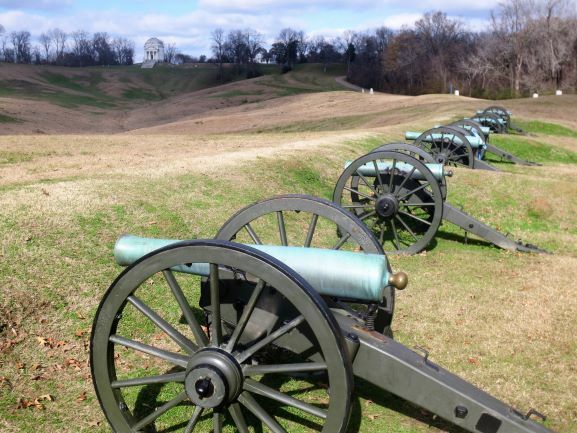 At our final stop in Vicksburg, Miss., we visited the site of one of the most pivotal battles of the Civil War. The surrender of Vicksburg by the Confederacy on July 4, 1863, gave the North control of the Mississippi River. Along with the Confederacy’s defeat the day before at Gettysburg, Pa., the South’s chance of winning the war had all but vanished. On a hillside across town, we visited the Vicksburg National Cemetery, where 17,000 Union servicemen are buried. All told, we traveled 682 miles roundtrip from New Orleans to Vicksburg, with a slight detour on the Yazoo River. The weather was surprisingly chilly; there were days when temperatures never climbed out of the 40s and a heavy fog often blanketed the river in the mornings. But cruise fares on the Mississippi in the winter are cheaper and the crowds are smaller than in the spring or summer; our boat was only about 70 percent full. Cruising the Lower Mississippi offers a distinctly different experience than river cruising in Europe. True, the scenery on the Mississippi isn’t as resplendent as what you’ll see on the Danube, Rhine or Seine. Instead of cruising past historic castles, churches and quaint villages, you’ll mostly sail by industrial barges and oil refineries. But the onboard experience on the Duchess was better than what I’ve experienced in Europe. The boat – including the cabins — was far more spacious, offered nicer amenities, and there was first-rate entertainment every night. 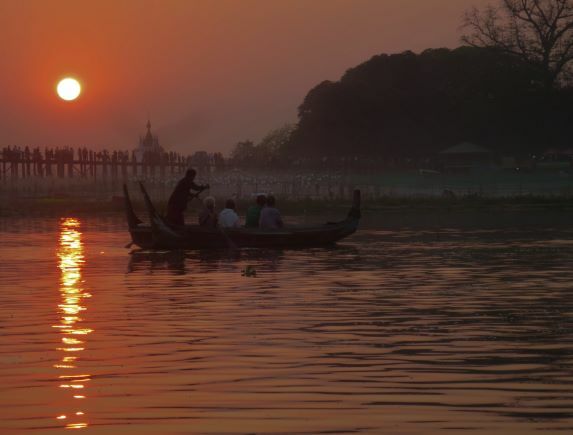 In addition to an onboard house band and entertainers, local singers would be brought on the boat to give concerts featuring music that originated in the region, including blues and country. The boat’s “Riverlorian” would give lively daily lectures about the river and its history. And the crispy Mississippi catfish, Louisiana gumbo and vegan jambalaya served in the Duchess’ two restaurants were delectable. It was never hard to find a bottle of Louisiana-made Tabasco sauce to add some heat. While the towns on the river can’t compete with the ambiance and architecture of a Vienna, Budapest or Strasbourg, a trip on the Mississippi offers its own unique charms and an authentic slice of Americana – especially music and food — that is difficult to replicate anywhere else. Rollin,’ rollin,’ rollin’ on the river. NEW ORLEANS — A “po-boy shrimp” sandwich, chicken jambalaya, and red beans and rice with sausage aren’t items you’ll typically find on the menu at an authentic kosher delicatessen. But at the Kosher Cajun Deli and Grocery in Metairie, La., a suburb of New Orleans, these are popular dishes, along with more traditional deli staples like corned beef, chopped liver, potato knishes and bagels and lox. Welcome to Jewish life in a city known as “The Big Easy,” where Jews have carved out their own colorful and unique traditions and thrived for centuries in the Deep South, a part of America where many other Jewish communities have struggled to maintain their religious and cultural identity. Indeed, the New Orleans metropolitan area is home to nine working congregations and about 11,000 Jews, a number that has tripled since Hurricane Katrina decimated the city in 2005. I recently spent a weekend in this city of about 1.4 million people, before boarding the American Duchess, an old-fashioned paddlewheel boat for a week-long cruise on the Lower Mississippi River. Before boarding the Duchess, I had a wonderful lunch at the Cajun Deli in Metairie with the restaurant’s founder and owner Joel Brown, walked from New Orleans’ famous French Quarter to visit the city’s oldest functioning synagogue, and spoke with Arnie Fielkow, the CEO and president of the Jewish Federation of Greater New Orleans. 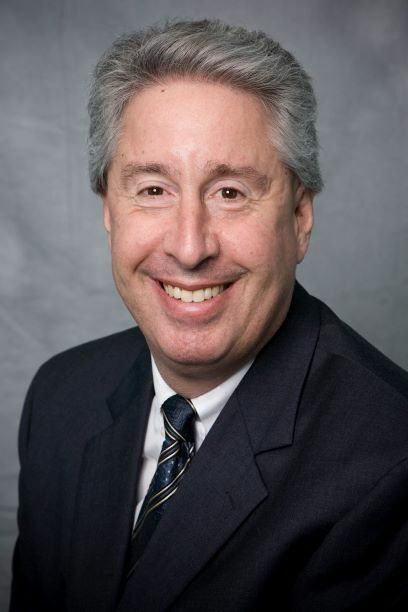 Fielkow, a former two-term New Orleans city councilman and executive vice president with the New Orleans Saints football team, assumed the reins of the Jewish Federation in 2017. Fielkow told me he is especially proud of the role the Federation has played in helping to rebuild the Jewish community since Katrina — one of the worst natural disasters in U.S. history — ravaged the city more than 13 years ago. Before the storm hit, about 10,000 Jews lived in New Orleans. Fielkow says that number shrunk dramatically – down to about 3,000 – 4,000 – in the years following Katrina. But now, thanks in part to several Federation initiatives, the Jewish population has actually swelled to about 11,000, higher than pre-Katrina levels. Fielkow says one of his priorities has been to further enhance relations with the city’s large African-American population, which comprises about two-thirds of its residents. He says Jews have a “very close connection” with the city’s Black residents, dating back to the civil rights movement of the 1960s. He adds that due to the city’s rich diversity, Jews have encountered little anti-Semitism. The first Jews arrived here in 1757, only a few decades after the city was founded. The Jewish population started to grow after the Louisiana Purchase in 1803, with most settlers arriving from the Alsace region of France. Jews became successful merchants and active in politics. In fact, Louisiana elected a Jewish lieutenant governor and attorney general in the 1850s. Most Jews in 19th century New Orleans, however, were not religious and intermarriage with the local Catholic population was commonplace. In the 19th and 20th centuries, Jews opened successful retail stores in the downtown part of the city and synagogues were constructed to meet the religious needs of the growing community. One of the synagogues, Anshe Sfard, was founded by Hasidic Jews from Lithuania in the mid-1920s and still exists as a Modern Orthodox congregation. 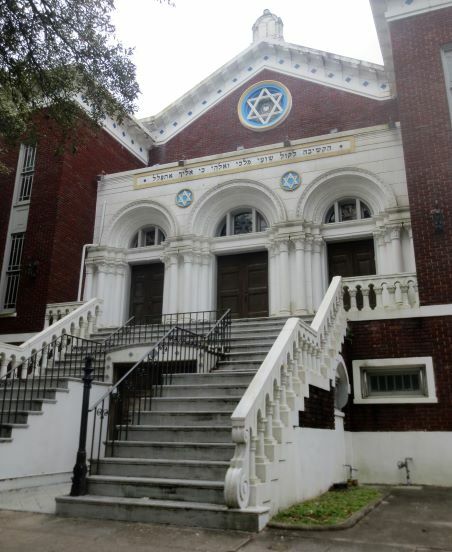 Located at 2230 Carondelet St., it’s the only synagogue within walking distance of downtown New Orleans. It took me about 45 minutes to walk to Anshe Sfard from the French Quarter to a section of the city known as the Garden District. With a beautiful exterior marked with triple-arched Neo-Byzantine doors, Anshe Sfard has been designated a National Historic Landmark. While the synagogue was forced to close for several months after Katrina, its Torah Scrolls were saved. Visitors are welcome for Shabbat services Saturdays at 9:30 a.m. Many of New Orleans’ Jews have recently moved to a western suburb called Metairie, which is home to a Jewish Community Center, two Jewish schools and several congregations. 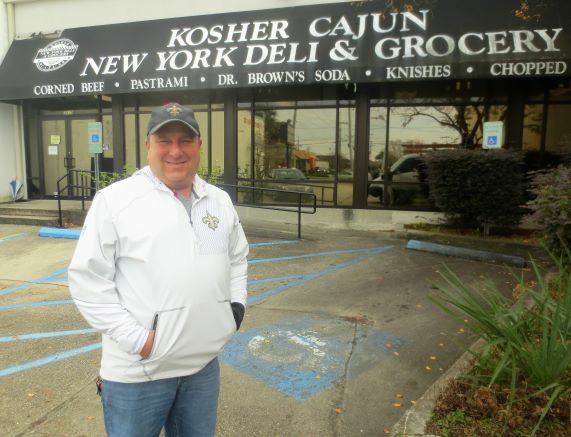 It’s also where Joel Brown, who was born and raised in New Orleans, decided 30 years ago to open a kosher grocery store, which has since expanded to a restaurant and Judaica shop. “Visitors coming from all over the country would say, ‘We have great New York deli. We want something different. We want your specialty foods that New Orleans is known for,’” says Brown. 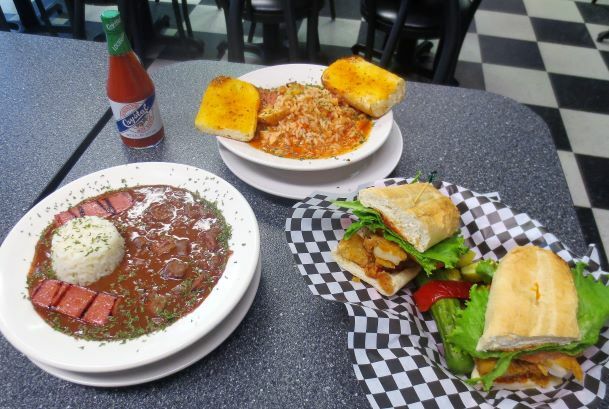 So Brown now serves such dishes as chicken and sausage jambalaya (made with kosher chicken and beef sausage), red beans and rice, and a popular local specialty called a “po-boy” sandwich. All of the meat Brown serves is Glatt Kosher under the supervision of a rabbi with the Louisiana Kashrut Committee. Brown has also carved out a niche as a leading supplier of kosher foods to conventions and the many cruise ships that depart out of New Orleans, including the ship I was on – the American Duchess. New Orleans has a reputation as a party town with a wild nightlife. But for Jewish visitors, it offers much more – a chance to experience a growing and vibrant Jewish community in a place many wouldn’t expect to find one. 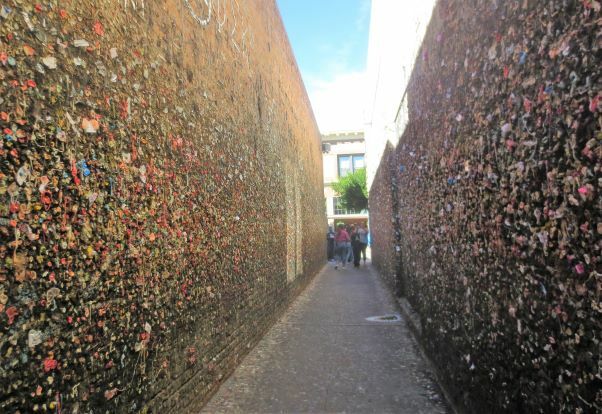 SAN LUIS OBISPO, California – Walk down the wrong alley on Higuera Street in downtown San Luis Obispo and you could find yourself in a sticky situation. It’s not street crime about which you’ll need to be concerned. Indeed, this sleepy college town in central California – called “SLO Town” by the locals — isn’t exactly known for being a hotbed of nefarious activity. No, there isn’t a local chapter of MS-13. Instead, you’ll want to make sure you keep your hands off the alley’s brick walls, which are covered with thousands of pieces of already-been-chewed Bazooka, Juicy Fruit and Trident. 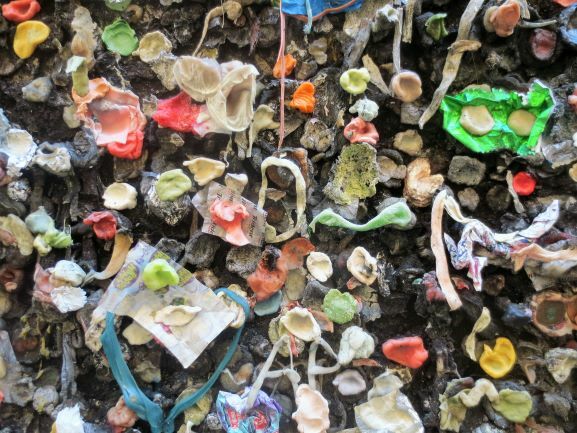 Welcome to Bubblegum Alley, a curious tourist attraction where adults can act like children – stick their used gum on a public wall — and no one will chastise them. There are different stories about how and when Bubblegum Alley originated, but most believe it started in the 1950s as part of a high school tradition that – well — stuck. Over the years, the city tried to discourage the practice, as many locals considered the place an eyesore. But downtown business owners realized it was attracting tourists, who brought not only their gum, but dollars as well. Now, a local bar owner steam cleans the alley once a month to keep things relatively sanitary. And a nearby candy store does a booming business selling gum to tourists who wish to leave a mark in San Luis Obispo – at least until the next steam-cleaning. As for me, I’m not much of a gum-chewer, so I just looked at the mass of used gum on the alley’s wall rather than add my own contribution. When posing for a picture, I did place my hand on the wall so as not to look like a stiff robot. As soon as my hand made contact with the sticky goo, I realized it wasn’t my smartest – or most hygienic — move. But the remnants of the pink Bubblicious came off after a thorough hand-washing. As I spent the rest of the afternoon exploring downtown SLO Town, my visit to Bubblegum Alley reminded me how much I enjoy exploring rather bizarre and offbeat landmarks. In terms of magnitude, history and beauty, Bubblegum Alley may fall short in comparisons with Niagara Falls, the Pyramids of Egypt or the Louvre in Paris. But try sticking your used Juicy Fruit on the Mona Lisa – if you can get close enough — and I’m guessing the authorities won’t look the other way. Anyway, something to chew on. Spend a few days in San Luis Obispo County amidst the colorful tapestry of vineyards, rolling hills, sand dunes, cattle ranches, beaches dotted with lounging elephant seals, and seaside shops in Morro Bay selling saltwater taffy, and you’ll see that SLO is much more than an acronym. True, but for those not content with sunbathing on the golden sands of Pismo Beach while munching on a tri-tip steak sandwich – a local specialty – and washing it down with a chilled Chardonnay produced in the nearby Edna Valley, San Luis Obispo also offers adventure-seekers plenty of chances to experience the outdoors in a more exhilarating way. During a recent four-day visit to this county of about a quarter-million people, I went paragliding in Santa Margarita, rode in a military Humvee up and down the wild terrain of the Pismo Dunes, took a three-hour sailing trip in a 44-foot yacht along the California coast, pedaled my way past several vineyards in the Edna Valley, hiked the Boucher Trail to the famous Piedras Blancas Lighthouse, and ziplined high above pinot noir vineyards. And for a more cerebral activity, I was even able to squeeze in a visit to perhaps the most iconic castle in the country – the Hearst Castle in San Simeon. The former home of newspaper magnate William Randolph Hearst has 165 rooms full of art that rivals museum collections. The castle is part of a working cattle ranch set on 127 acres and offers stunning views of the Pacific and rolling hills of central California. 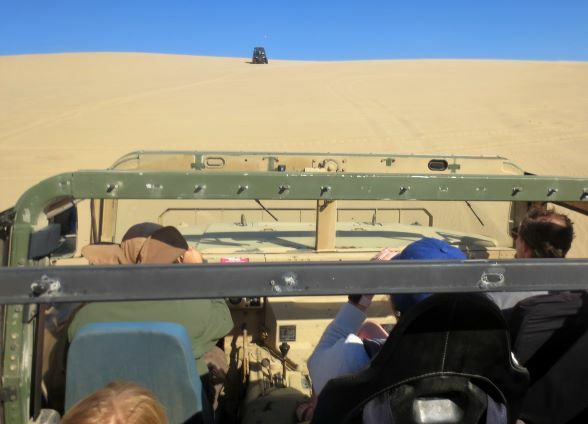 “Do you want wild or mild?” our driver asked our group of five as we strapped ourselves into a 1987 U.S. Marine Corps Humvee for the drive to the dunes at the Oceano State Recreation Area near Pismo Beach. I was outvoted. Wild it was. The trip made prior four-wheeling dune rides I had taken seem like the Disneyland teacup ride in comparison. But our seasoned driver with Pacific Adventure Tours, the largest Humvee tour company in the country, was firmly in command. Never once did I feel like we were close to tipping over, even when the driver zig-zagged across dunes seemingly as tall as skyscrapers. The views of the Pacific – which I enjoyed while holding on tight and clenching my teeth — were magnificent. Following the ride, we enjoyed a bonfire and clam chowder at nearby Grover Beach. With more than 250 wineries, San Luis Obispo County is California’s third-largest wine-producing region (behind Napa and Sonoma). 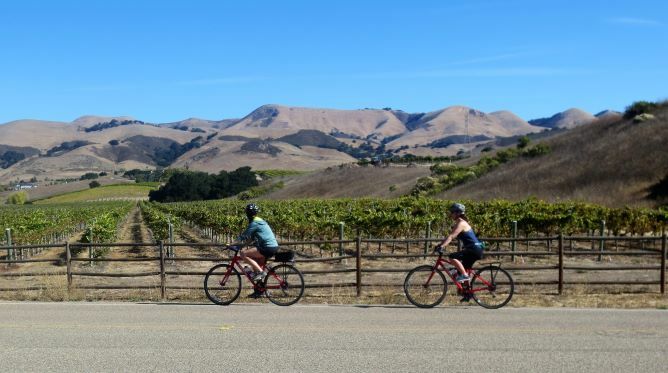 I took a 6-mile bike tour past numerous vineyards through the bike-friendly Edna Valley, and stopped at two wineries for tastings along the way. SLO CAL is known for producing top-notch reds and whites and offers a less touristy experience than wineries with more acclaimed – and expensive — products 200 miles up the coast. 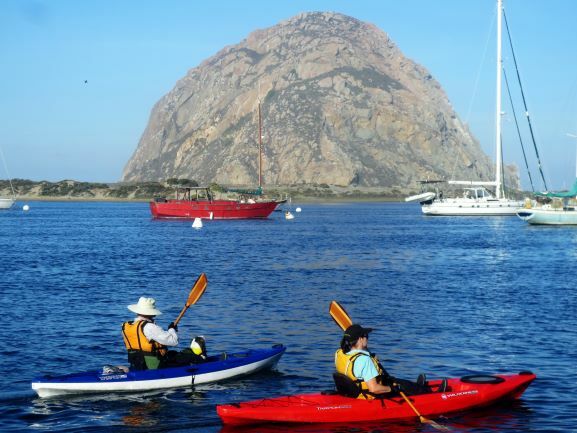 Not for the faint of heart, this is the most exhilarating way to experience the natural beauty of the ocean, mountains and farmlands of San Luis Obispo County. My WingEnvy Paragliding pilot and I took off on a motorized paraglider attached to a parachute in Santa Margarita, a few miles inland. Originally, we were scheduled to fly closer to the coast, but the ocean winds were too strong. 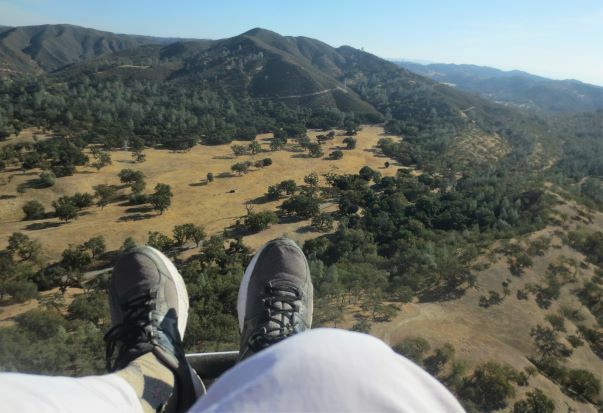 My ride lasted just 10 minutes and the landing was a bit bumpy, but it was the most spectacular and picturesque activity of the trip (see video shot by the author of the landing: Paragliding in San Luis Obispo County). Wildlife lovers will enjoy a 2-mile hike on the Boucher Trail that begins at the Piedras Blancas Elephant Seal Rookery, the largest on the West Coast. In peak times — December through March — there are 17,000 seals on these beaches. Docents are stationed on the trail to explain the animals’ behavior and mating habits. Gray-whale sightings also are common, especially in the spring when the whales migrate to Alaska. The hike ends at the Piedras Blancas Lighthouse, which was first illuminated in 1875. It’s open for tours and is now used as a research facility and wildlife sanctuary. For those who want amazing views of the landscape but a tamer experience than paragliding, Margarita Adventures offers a zip-line tour in Santa Margarita. 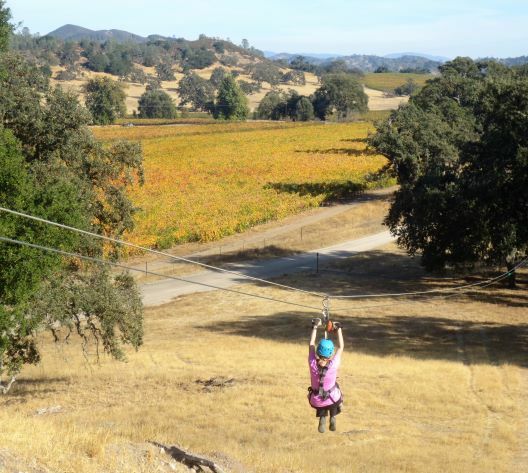 The two-hour tour includes six zip lines spanning more than 7,500 feet and takes about two hours to complete. It’s easy to get to San Luis Obispo; American Airlines offers daily 90-minute nonstop flights from Phoenix. The airport is just a 10-minute drive from the heart of downtown San Luis Obispo, the county seat. “SLO Town,” as it’s called by the locals, has a population of 45,000 and is home to a major university, Cal-Poly. Founded in 1772, San Luis Obispo is one of California’s oldest communities and is worth exploring for an afternoon. Accommodations in the region are pricey; an average hotel costs about $250 a night. The Cavalier Oceanfront Resort in San Simeon is a good choice; it’s a short drive to the Hearst Castle. You’ll want to rent a car as public transportation in the area is virtually non-existent. Even finding an Uber or Lyft driver was difficult. But it’s best to act like the locals if things move at a more relaxed pace than you’d like. Chill out, have a glass of wine and enjoy the sea air. In other words, take it SLO and easy. HAVANA, Cuba – The first thing you notice is the cars. Say what you will about the Cuban government, you can’t help but marvel at the classic American automobiles that make this city of more than two-million people look like an enormous open-air car museum. 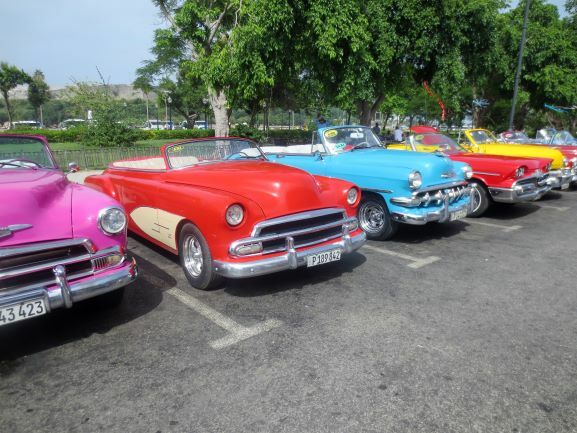 The streets of Havana are full of brightly painted American cars in a wide array of colors – many of which are sleek, two-toned convertibles — built in the 1950s. Most are Chevrolets, although you’ll also see vintage Fords and Plymouths. Known by the locals as “almendrones” because they’re shaped like giant almonds, some of the vehicles look like they’re right off the assembly line. Others resemble clunkers that have been salvaged from a scrapyard. But the fact that the cars are still running is a testament to the Cuban people, who’ve had to make due with restrictive laws on foreign car imports and an American trade embargo since dictator Fidel Castro gained power in 1959. My visit to Havana was easily the highlight of a 14-day cruise on the Holland America Veendam that started and ended in Boston, with stops in two Cuban ports, as well as visits to Florida’s Key West, Grand Cayman, Jamaica and a private island owned by Holland America called Half Moon Cay. Like most of my fellow 1,400 passengers from 27 countries, I chose the cruise primarily because it offered a rare chance to visit Cuba (pronounced Koo-bah by the locals), which had been mostly off-limits to American tourists until President Obama reestablished diplomatic relations with the island in 2015 after a 55-year hiatus. However, the Trump Administration last year tightened sanctions on Cuba and the State Department later issued a level 3 – “reconsider travel” — advisory after it accused the Cuban government of attacks on U.S. Embassy employees in Havana that caused hearing problems, headaches and other health issues. For travelers, it’s important to note that Cuba is actually safer than many other Caribbean islands. Street crime in Havana is rare and I encountered no anti-American sentiment. 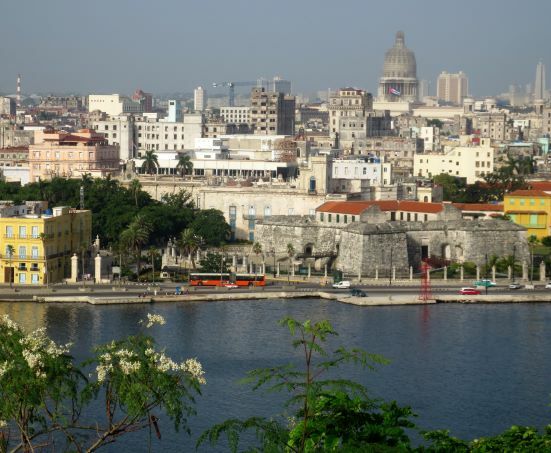 Cuba, the largest island in the Caribbean, has a population of 11.5 million. Shaped like a crocodile, it’s located only about 100 miles south of Key West. The island offers much more than just eye candy for antique car buffs. Havana is a vibrant city with eclectic architecture reflecting its Spanish colonial history, numerous cathedral-anchored plazas, and a culture rich in art and music. There are street musicians on seemingly every block. I attended two formal concerts, both of which featured Latin rhythms and a percussion-heavy sound that had many members of the audience out of their seats and dancing (see video shot by the author: Havana musical performance). In 2016, the Veendam’s port lecturer, Francisco Gonzalez Larumbe, was on the first cruise ship to visit Cuba in 50 years. During several lectures, he painted a realistic picture of what life is like for Cubans who have lived in difficult economic conditions and relative isolation since Castro rose to power. Gonzalez Larumbe also taught us several “Cubanismos,” phrases used by the locals. For instance, asi es Cuba, which literally means “so is Cuba,” is a mantra that guides Cuban life. In the case of the vintage cars, this means keeping the vehicles freshly painted, the chrome fenders sparkling, and the gas-guzzling engines running with spare parts from anywhere Cubans can find them. Many of the almendrones are used as taxis; like most cabs around the world, negotiate the fare before you hop in. 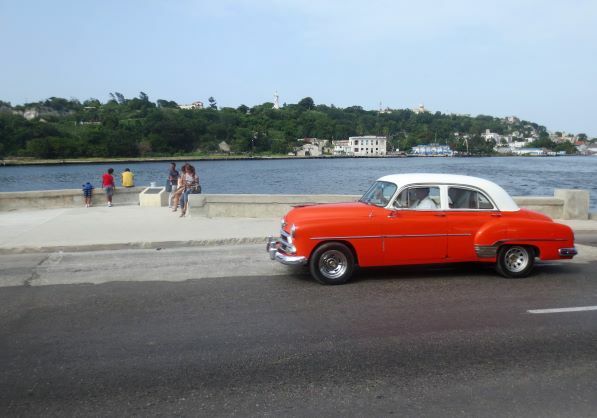 It’s hard to beat a drive in a 1950s convertible on Havana’s famous Malecón, a 5-mile seaside promenade that begins in Old Havana one block from where the cruise ships dock. Cruising is a relatively safe and convenient way to visit Cuba. 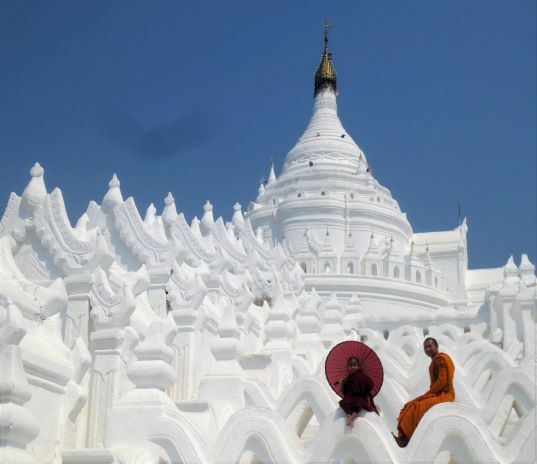 The tours offered by the Veendam are designed to conform to the “people-to-people” State Department requirements. In Havana, we were taken to see a community center that houses the work of local artists, with proceeds benefiting the poor. And while the tour guides are employed by government-owned travel agencies, they didn’t inundate us with pro-Castro propaganda and freely answered our questions, even about Castro’s colorful private life. I was expecting to see Castro’s image plastered all over the city. Not so. One of our guides told us that before he died in 2016 at the age of 90, the Cuban dictator decreed that he didn’t want his likeness used for political or commercial purposes. 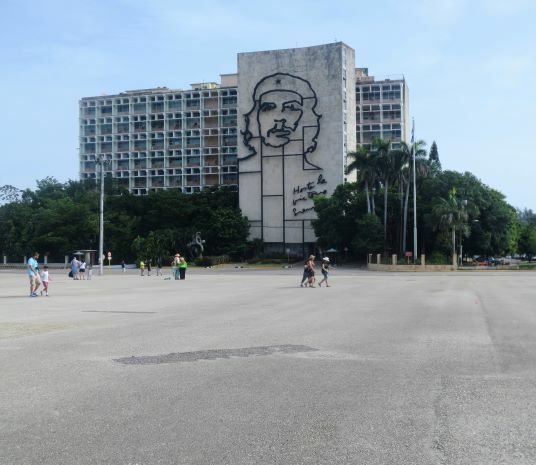 Instead, billboards and political posters of another Marxist revolutionary who helped Castro rise to power – Argentine-born Che Guevara – are seen throughout Havana. Merchandise with Guevara’s likeness fills souvenir shops. In Revolution Square, where Castro was known to give speeches that lasted up to eight hours, a steel memorial of Guevara dominates the façade of the country’s Ministry of Interior building. In addition to Havana, we also spent a day in Cienfuegos, a city of about 150,000 people on Cuba’s southern coast. Dubbed La Perla del Sur (“Pearl of the South,”) its historic city center has been designated a UNESCO World Heritage Site. 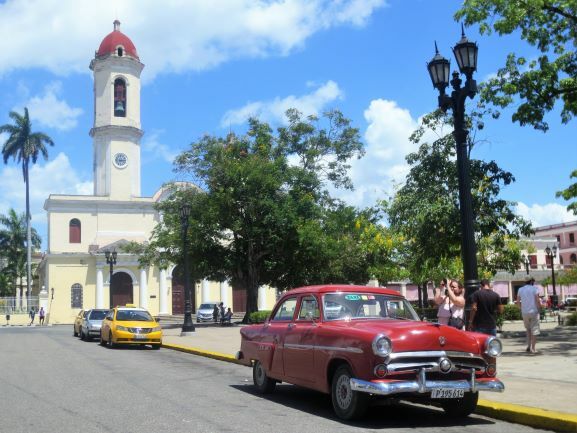 If you can tolerate the heat and humidity, now is an excellent time to visit Cuba. The door to visit the country is partly open and can swing either way. If it closes shut, Americans will no longer be able to visit. If it swings wide open, the island will likely be overrun with tourists and lose much of its authenticity. VILLERS-BRETONNEUX, France – For such a stunningly beautiful part of the world, it’s hard to fathom the horrific carnage that took place here more than 100 years ago on the Western Front during World War I.
Amidst the rolling hills in Normandy bearing golden wheat fields, apple orchards and tiny medieval villages, are the remnants of what’s been called by historians the bloodiest battle in the bloodiest war ever fought by mankind. For more than four-and-a-half months beginning July 1, 1916, Allied troops, led by soldiers from France, the United Kingdom, Canada and Australia, fought the Germans in the Somme region of northern France spanning both sides of the Seine River. 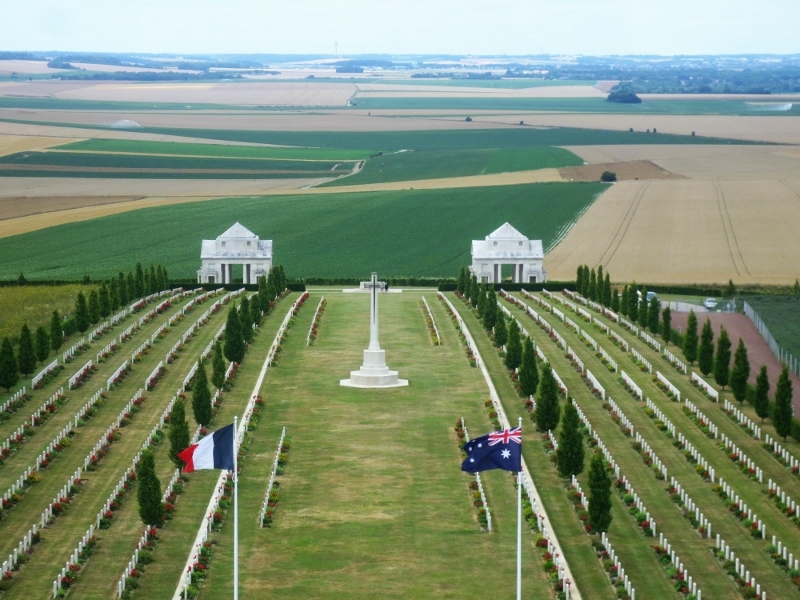 My visit to the Somme battlefields was one of the most impactful and emotional days on a week-and-a-half cruise on the Seine River on the Scenic Gem that started and ended in Paris. Like many Americans, I was reasonably well-informed about the D-Day invasion in World War II and had previously visited the Normandy landing beaches. The battle of the Somme was mostly fought under horrific conditions in trenches by armies just a few yards apart, separated by “no-man’s land.” Venturing outside of a seven-foot-deep trench on the front lines often meant instant death. The Somme also marked the first use of tanks on a battlefield, although the British armored vehicles used at the time were unreliable and yielded only mixed results. By the time the battle of the Somme ended on Nov. 18, 1916, more than one million men were killed or wounded. In comparison, that’s more than double the causalities suffered in the World War II D-Day invasion and the entire battle of Normandy in June 1944. There are numerous military cemeteries, many of which contain the graves of soldiers who were never identified, scattered throughout the Somme. 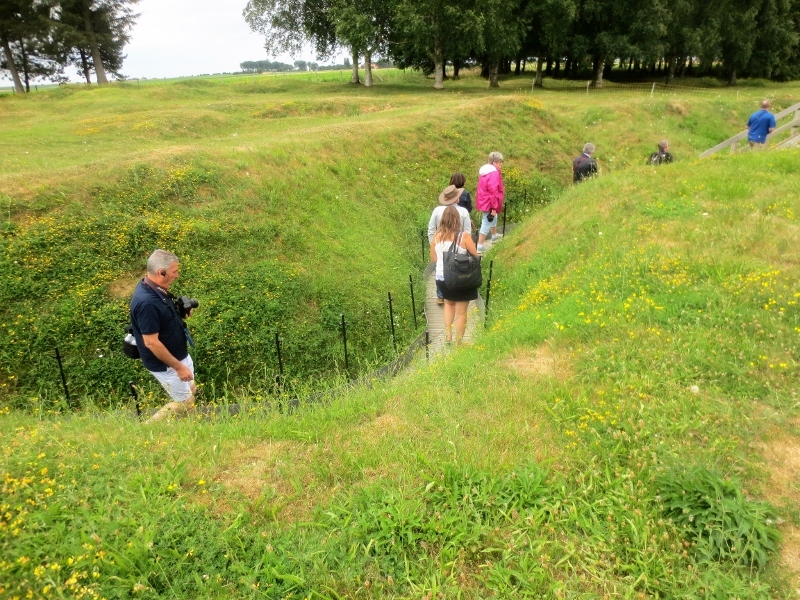 Even though the battle was fought more than a century ago, the trenches are still visible and some have been paved so that visitors can walk through them. 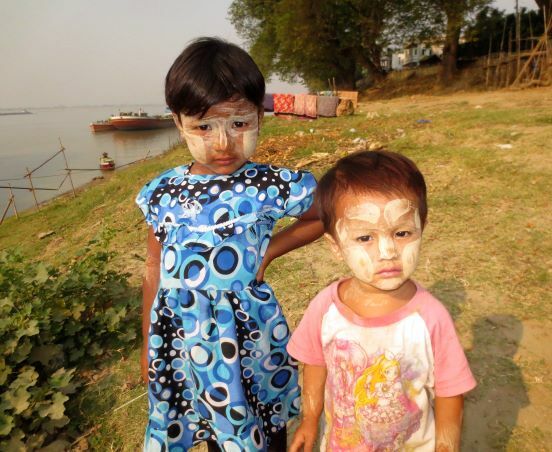 The area still contains undetonated shells from the war and after a hard rain, it’s not uncommon for locals to spot the remains of soldiers in the mud, whose bodies were never recovered. While Allied forces are considered the victors in the battle of the Somme, they gained little territory in the process. But the battle seriously weakened the German army. America entered the war a year later and its fresh troops helped the Allies gain the upper hand, ultimately culminating with Germany’s surrender in 1918. The cruise also included a visit to the moving American military cemetery overlooking Omaha Beach on France’s northern coast, site of the D-Day invasion which turned the tide turned during World War II and led to Germany’s surrender to the Allies in 1945. The cemetery contains the remains of more than 9,000 Americans. In stark contrast to the grim reminders of the first two world wars, the cruise also included visits to some of the most beautiful and tranquil settings in Europe, including the famous Giverny Gardens on the right bank of the Seine. 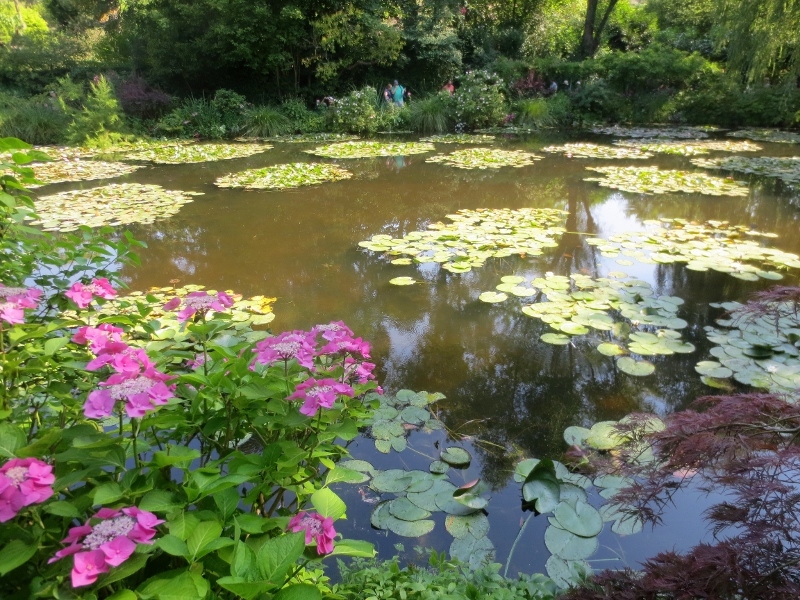 The famous Impressionist painter Claude Monet lived in Giverny and we visited the water-lily ponds that were the focus of much of Monet’s work during the latter part of his life. We spent a day in Deauville, a seaside resort on the English Channel known as a playground for French high society. Deauville features numerous half-timbered buildings, a trademark of Normandy’s traditional architecture. Our visit happened to coincide with France’s Bastille Day, which commemorates the turning point of the French Revolution in 1789. We were treated to a magnificent fireworks show from the top deck of the Scenic Gem while docked in a small village on the Seine. The light show chronicles the church’s tumultuous history, including Viking invasions, fires and lightning strikes. It’s just a 10-minute walk from where the river ships dock and is offered free after dark during the summer months (see video shot by the author: Rouen cathedral light show). 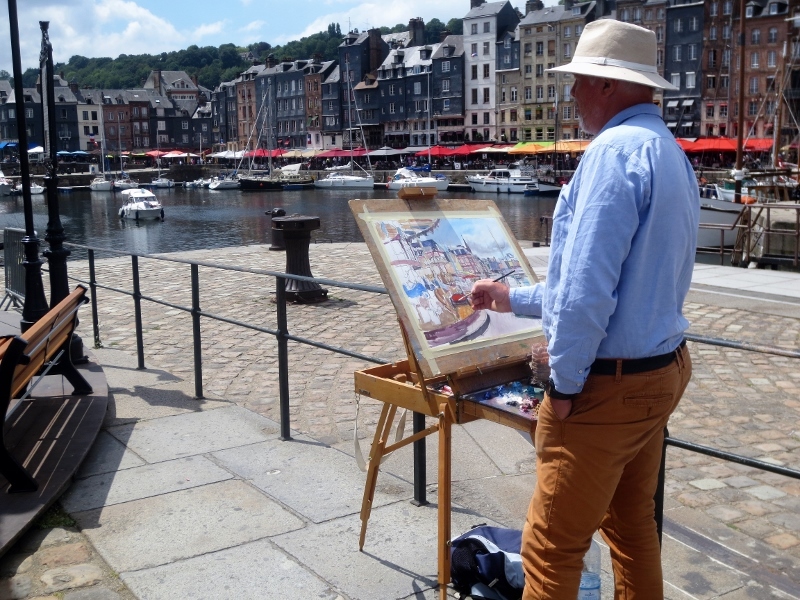 All told, we sailed about 400 miles roundtrip on the winding Seine from Paris to the picturesque port of Honfleur near the English Channel, leisurely meandering past numerous castles, cathedrals and chateaus. 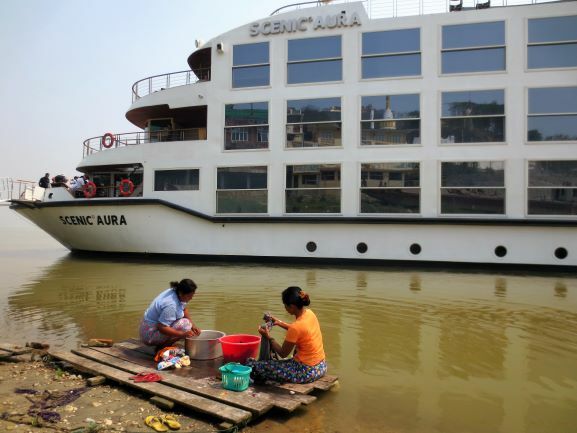 Built in 2014 specifically for the Seine, the Scenic Gem is one of only a handful of the 19 ships now sailing the Seine that can navigate the river’s numerous locks and sharp turns and make it all the way to Honfleur. 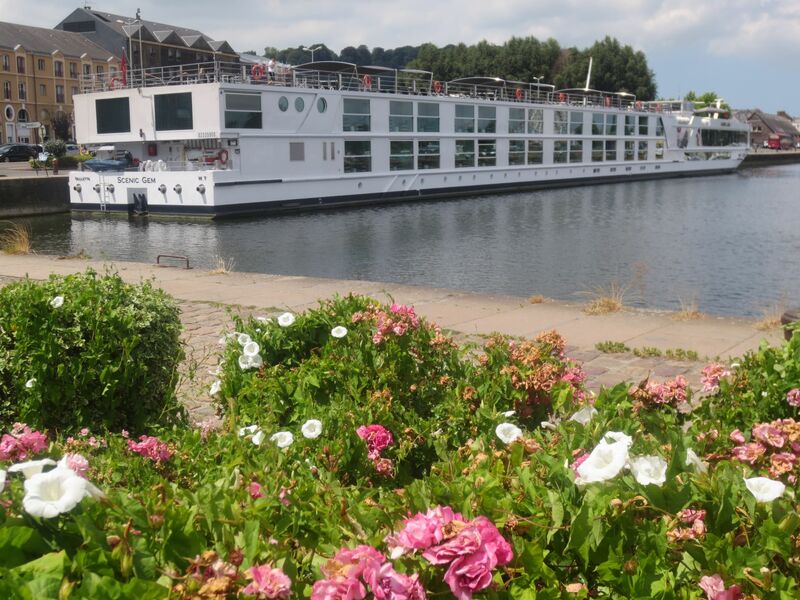 Cruising the Seine is a relaxing way to explore northern France and by eating meals on the ship, you’re immune from the exorbitant costs of French restaurants. 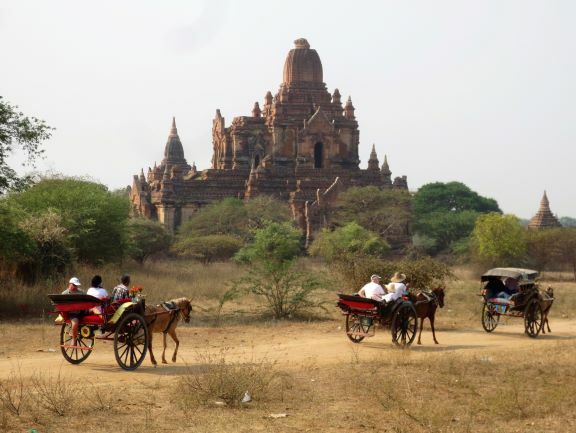 The weather during the trip was spectacular – sunny most days with highs in the 80s. The only exception was our day spent at the Somme battlefields, when it was cold, windy and rainy. It somehow seemed fitting given the horrible loss of life that took place in northern France more than a century ago for so many soldiers from all over of the world. I was pedaling my 10-speed hard on a sweltering June day through the streets and dirt backroads of this town in the hills of northeast Mississippi and the lyrics of my favorite Elvis Presley song – “Burning Love” — kept running through my head. Sweat-drenched shirt aside, I was thoroughly enjoying myself as I explored the sites related to the formative years of one of the most significant cultural icons of the 20th century. Elvis Aaron Presley was born in Tupelo in 1935 and lived the first 13 years of his life here before moving to Memphis with his parents. Today, 41 years after Elvis’ untimely death at his Graceland mansion in Memphis, Tupelo attracts 50,000-100,000 Elvis-loving tourists a year. Many arrive on tour buses from Memphis, a 90-minute drive away. But for those who want less of a cookie-cutter experience you get sitting on a bus tour, there’s now another alternative. 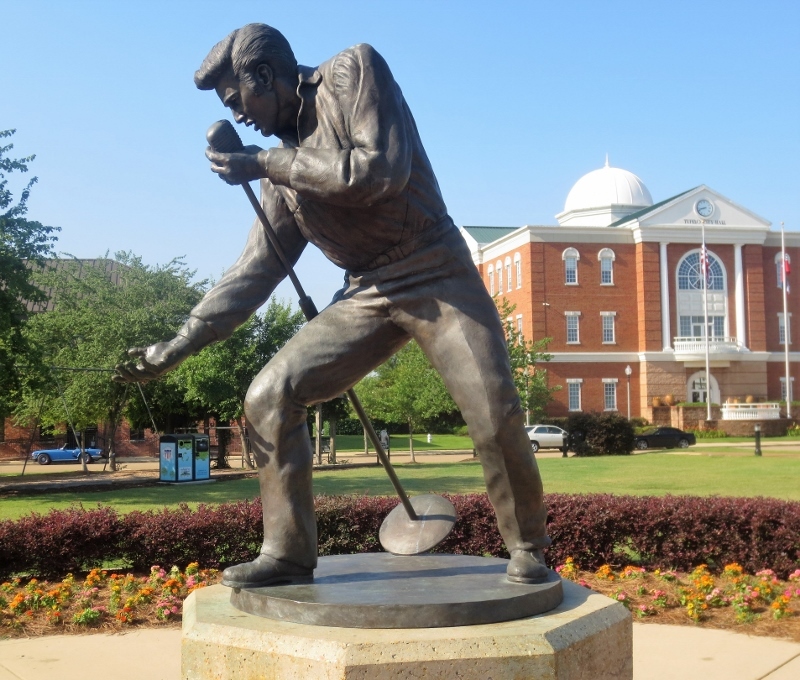 In May, Tupelo’s Convention and Visitors Bureau inaugurated a self-guided, Elvis-themed bike tour that takes visitors to 13 marked sites throughout the city tracing the King of Rock ‘n’ Roll’s upbringing. If you can endure the heat, it’s an inexpensive and flexible way to see the sites at your own pace and work off some pounds from the tasty – but fattening – southern comfort food in which you’re likely to indulge. For $12, you can have a bicycle delivered in the morning directly to your hotel and then have it picked up at the end of the day. For maps, descriptions of all the sites, and to order a bike, visit tupelo.net. So far, the response has been better than the city hoped. 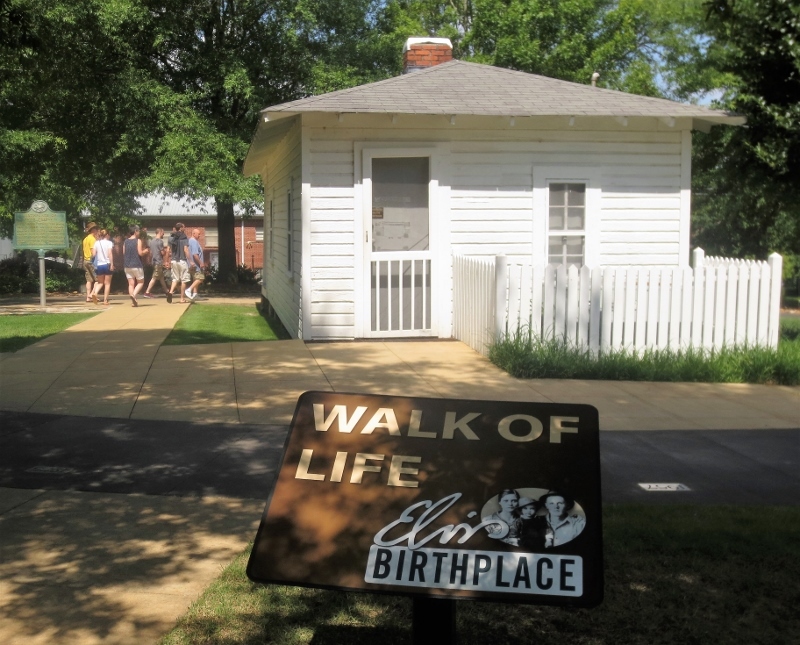 Fittingly, I began the bike tour by pedaling a mile east from my hotel to the humble, two-room dwelling where Elvis was born and lived the first two years of his life. His parents struggled financially and the family moved several times during Elvis’ 13 years in Tupelo. The house, built by Elvis’ father, grandfather and uncle in 1934, is the centerpiece of a 15-acre park that includes a “Walk of Life,” a series of concrete blocks that traces each year of Elvis’ life. Next door to the house sits the Elvis Presley Museum, which contains memorabilia related to Elvis’ legendary career, most of which was collected by a family friend. The complex also includes a transplanted Assembly of God church that Elvis attended as a boy. It was here that Elvis was first exposed to the rich, Southern gospel that became a staple of his musical repertoire. Inside, visitors can experience a multi-media presentation of a 1940s Pentecostal church service, complete with an actor playing a young Elvis singing in front of the congregation. From the birthplace, I rode down some dirt roads to visit the Mud Creek Swimming Hole, where Elvis and his friends would sneak a dip so their mothers wouldn’t know they were swimming unsupervised. By then, it was lunchtime. I pedaled to Johnnie’s Drive-In, where Elvis used to come with his friends after school for a cheeseburger and RC Cola. It’s still an operating restaurant today and was packed, mostly with locals. I had to wait for a family to finish its meal before moving into the popular “Elvis Booth,” where Elvis was once photographed. Yes, I ordered a bottle of RC Cola. While it was a bit too sugary for me, I figured if it was good enough for The King, it was good enough for me. 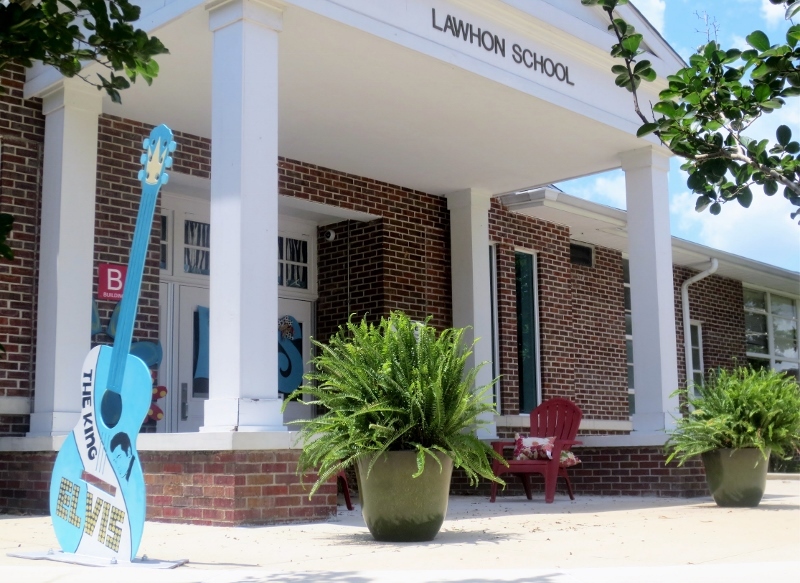 Two blocks away, I visited Lawhon Elementary School, which Elvis attended from 1941-1946. A decorative guitar sits out front, in honor of the still-functioning school’s most famous student. After reaching stardom, Elvis returned to Tupelo in 1956. His concert in a park in front of City Hall is immortalized in “The Homecoming Statue,” based on a photo in which Elvis reached into the crowd to touch hands. Perhaps my favorite stop on the journey was at the Tupelo Hardware Co. on Main Street in the city’s historic district. Founded in 1926 by the same family that still owns it, Tupelo Hardware may be the only hardware store in the country that employs a full-time docent. What Tullos does know about is the nuts-and-bolts behind Elvis’ first guitar, which his mother Gladys bought him for his 11th birthday. The two came into the hardware store to shop for Elvis’s present. The story goes that Elvis wanted a rifle or bicycle, but his mother refused. A store employee then brought out a guitar and handed it to Elvis. 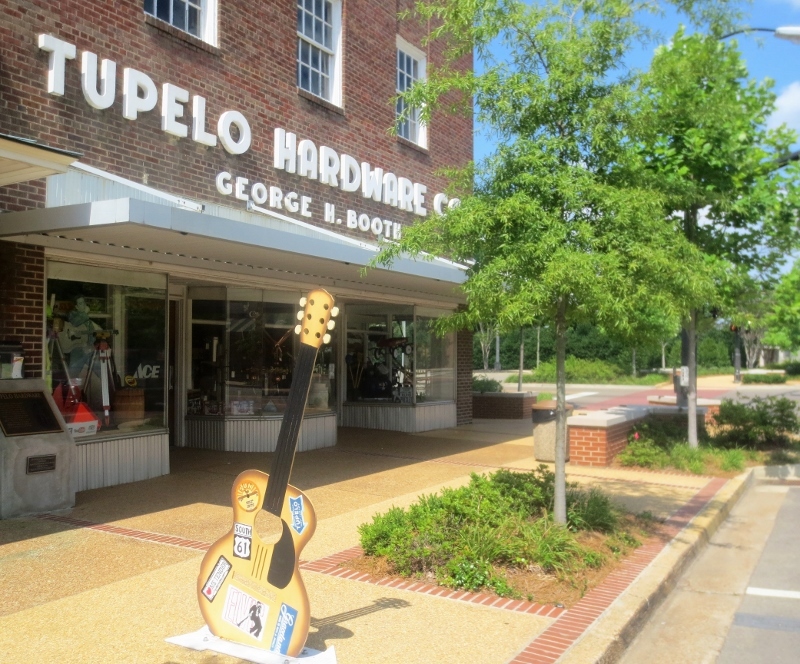 Elvis got his first guitar at The Tupelo Hardware Co.
For those wanting a break from the Elvis-related sites, Tupelo is the headquarters of the Natchez Trace Parkway, a historic travel corridor used by Native Americans, European settlers and soldiers. One of the prettiest stretches of road in the country, the parkway spans 444 miles from Nashville, Tenn., to Natchez, Miss. There are numerous walking trails, camping sites and exhibits located near the road, which has a rigidly enforced speed limit of 50 mph. 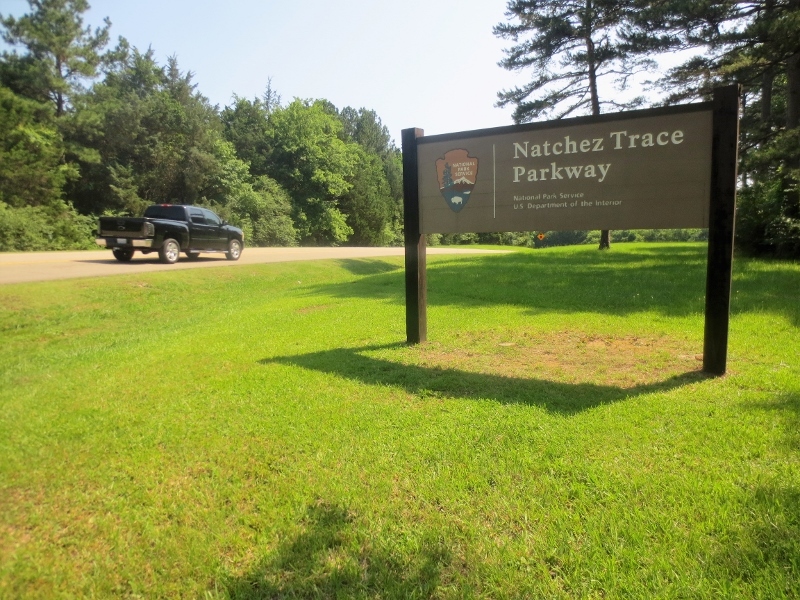 I’m told the Natchez Trace is breathtaking when the leaves are changing color in the fall. It’s also worth visiting the Tupelo Automobile Museum, which has a collection of more than 100 cars, dating back to a 19th-century steam-powered vehicle. There are cars owned by Liberace, B.B. King, and of course, Elvis. In addition to a 1976 Lincoln Elvis bought and gave to a friend, the Elvis exhibit includes a collection of 33 original movie posters from his movies configured to spell his name. About 38,000 people live in Tupelo, who proudly embrace their favorite son’s impact on pop culture around the world. Seemingly, every store, restaurant or music venue in town has some sort of Elvis reference. For dinner at the popular Neon Pig, a combination butcher shop and restaurant, I ordered the “Belvis Burger.” It was a hamburger topped with pork belly. I’m guessing The King would have smiled.